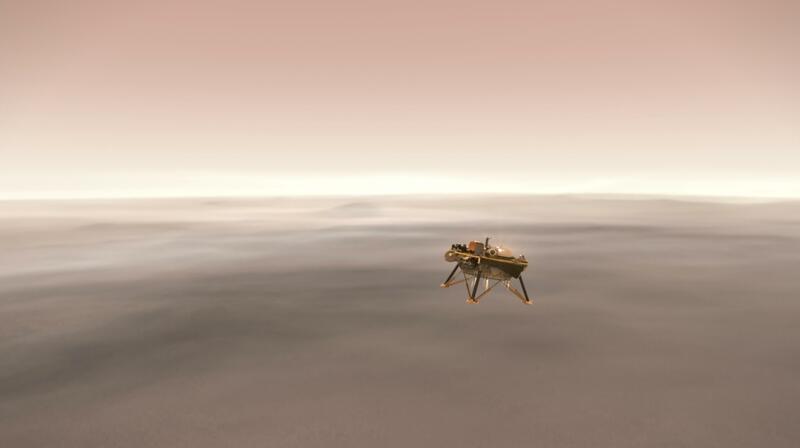 This illustration shows a simulated view of NASA’s Interior Exploration using Seismic Investigations, Geodesy and Heat Transport (InSight) lander firing retrorockets to slow down as it descends toward the surface of Mars. Launched on May 5, InSight marks NASA’s first Mars landing since the Curiosity rover in 2012. The landing will kick off a two-year mission in which InSight will become the first spacecraft to study Mars’ deep interior. Its data also will help scientists understand the formation of all rocky worlds, including our own. InSight is being followed to Mars by two mini-spacecraft comprising NASA’s Mars Cube One (MarCO), the first deep-space mission for CubeSats. If MarCO makes its planned Mars flyby, it will attempt to relay data from InSight as it enters the planet’s atmosphere and lands. InSight and MarCO flight controllers will monitor the spacecraft’s entry, descent and landing from mission control at NASA’s Jet Propulsion Laboratory (JPL) in Pasadena, California, where all landing events will take place.